Island Batik's July project for Ambassadors is Christmas in July! It was very odd making something Christmasy when it's 90 degrees outside! I was thinking about ornaments and all those gorgeous ones that are hand painted with gold paint. I decided that the gold paint could easily be done in gold thread! The fabrics used in this quilt are from Island Batik's Holiday Happenings collection. I started with the ornament shapes. I drew this on Steam-a-Seam 2. Since the ornament shape was huge (almost the size of a piece of paper), I decided to try using fusible only around the edge. I've never done this before and I was quite happy with the results. I also cut out nine ovals and a gold piece for the top of the ornament. For all my friends who are new to machine applique, this is a great tutorial for how I do my work. Since I'd never done a large shape with fusible only around the edge I didn't realize that I should've cut my fusible on the inside line. Oh well, it's only an extra 1/8 inch so it wasn't that big of a deal. However, since I learned something I thought I should share it. Here you can see that I've applied the dots to the ornament. I did this using my pattern and a lightbox (the Artograph lightboxes are absolutely fantastic and I HIGHLY recommend them if you use a lightbox regularly). I decided aligning these through one piece of fabric (the red) instead of two (the red and the background) would be simplest. I also knew they were going to stick out a little over the edge. To get these prefect ovals I used an oval template tracer I bought at my local office supply store. I have a circle one too. They're fabulous if you use circles and ovals a lot like I do. Below you can see that I did indeed have a bit of green oval sticking out. I cut these off before I applied the ornament to the background fabric. Here you can see that I am testing out my background fabric and borders. I wanted to see how wide I should make them. I usually do this visual test when I'm designing. Here is the finished quilt before the binding was turned. Come back Saturday to see how I quilted this Ornament Quilt! If you missed my last post about the applique for my Ornament Quilt you can find it here. I'm doing this project for my Island Batik Ambassador's Christmas in July challenge. Here is the finished quilt. I was inspired by old fashioned painted ornaments. I had so much fun quilting my Ornament Quilt. I did the top so it looked like those folded metal tops ornaments often have. I also had some fun adding circles and feathers underneath the gold top. Here is the center of the ornament. Most of details are quilted twice. Yes, I backtracked over most of it to help it stand out. I was going to use gold metallic thread, but metallic thread and I really don't get along. Yes, I tried a sample and I just wasn't happy with what I was seeing so I ended up using a gold rayon Splendor thread from Wonderfil since it was the right color. Here is the fan of feathers from the bottom of the quilt. I decided to try out a new quilting filler design on this quilt and play around with it. Essentially it is a large circle with a swirled S inside. Sometimes the is proper and sometimes it is a reverse image depending on how I started the curl. Come back Wednesday to see a tutorial on this design. Here is the back of the quilt. You can see that I match my top and bottom threads when I free motion quilt. I like using solids on my backs so I cans ee the quilting there too. The circles here were made by doing a wave in one direction and then coming back and finishing the wave with a second round creating the circles. I've never done this many of them this way without marking. I'm pretty happy with my first results. I have learned that my curves have to look like the drawing below in order to make them turn out nicely. Below are visuals for how I created my circles. You'll notice that the top line goes up and down almost in a U shape. It has to be this steep or the circles don't turn out nicely. You can see what I mean by looking at the third row. They aren't steep enough and end up looking more like eyeballs than circles. The second row has two colors. 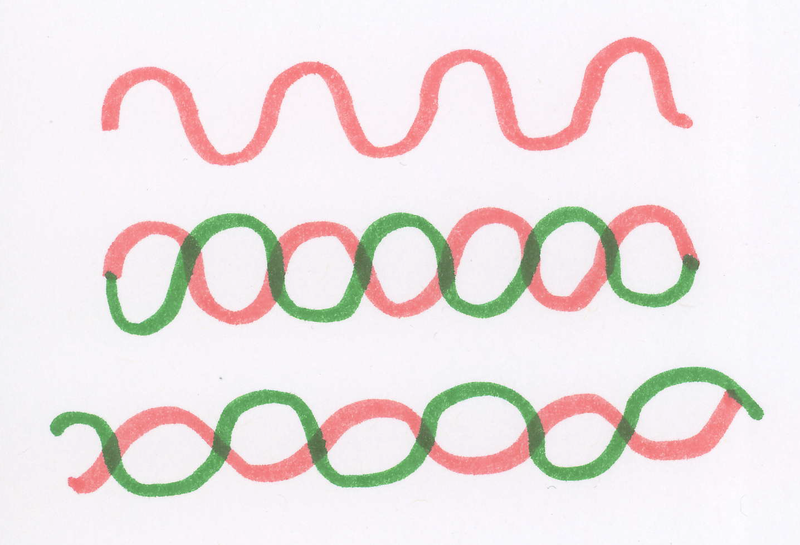 The red would be the original wave and the green is the second save done to complete the bubbles. For the outer border which was very busy, I chose a simple figure eight pattern. It is the first time I have ever quilted a figure eight and you can tell! It was a learning experience for me. Now for a few photos of the filler I created. I'll started by using little circles (look at the left side of the photo above) to fill in any extra space. I decided I didn't like this too much so I tried to instead give the effect of the large bubbles going off the fabric. Look closely at the edge nearest the bubbles below and you can see what I mean. There is a circle that is clearly not complete and would go off the fabric. What a happy little quilt! I really enjoyed doodling with quilting on the ornament and will most likely try it again sometime.